Even while the FLAK 36 was entering service the Luftwaffe began to look ahead. From what they knew of their own aircraft it was obvious that the speed and height of bombers was bound to increase, eventually reaching a point where the Flak 36 would no longer be able to deal with them. The muzzle velocity and the rate of fire would have to be increased, and, as it seemed that an anti-tank capability might also be needed, the weapon wanted to be of low silhouette. 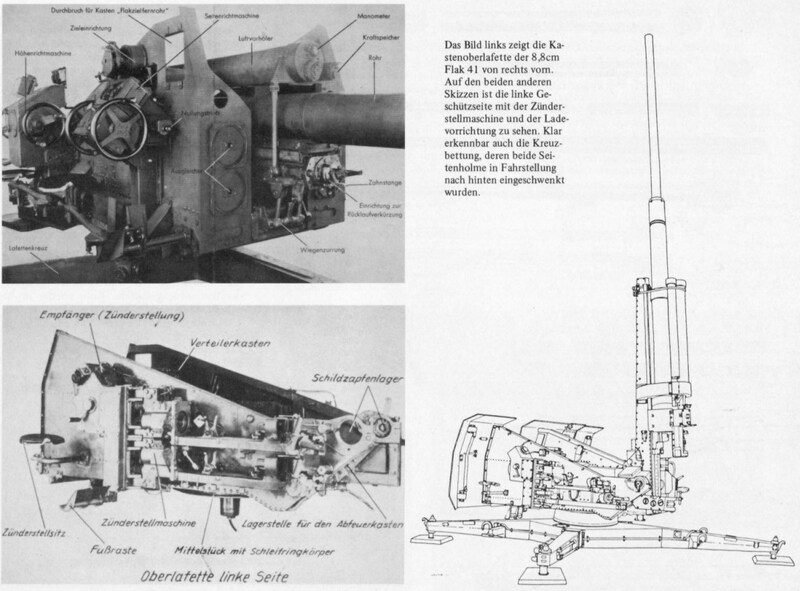 Under the title of Gerät 37 a specification was issued in the autumn of 1939 calling for a gun weighing not more than 8000kg, firing 25 rounds per minute at 1000mps. Rheinmetall-Borsig was given the contract and their first prototype was ready for trial in early 1941. 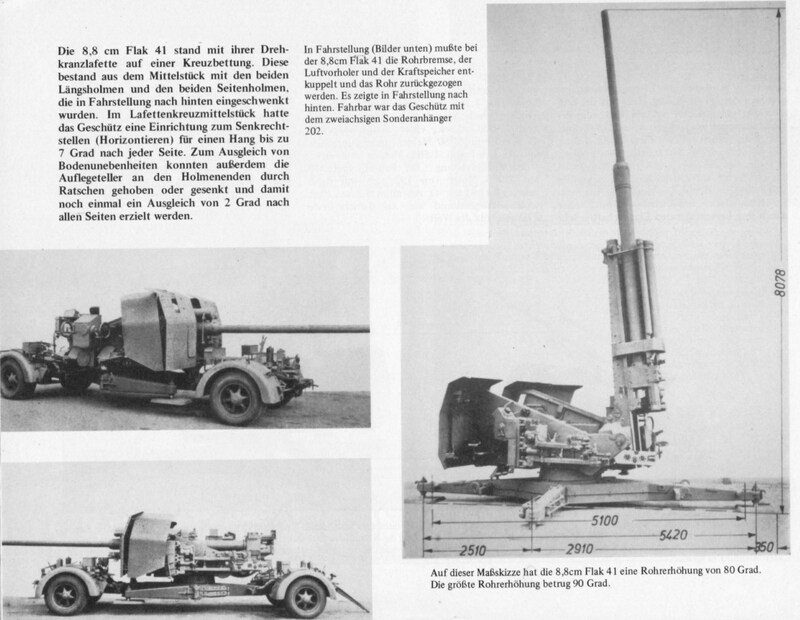 The title `Gerät 37′ was causing some confusion with the existing Flak 37 gun, and so the new project was officially called the 8.8cm Flak 41. Shortly before the appearance of the prototype the Luftwaffe, hearing that all was not well with Rheinmetall’s development, issued another contract to Krupp in the hope that they might develop a competitive gun. The Krupp project became Gerät 42, but (although it showed some promise) it was dropped early in 1943 when the Luftwaffe asked for even more performance. The Rheinmetall-Borsig design was a very good one indeed. 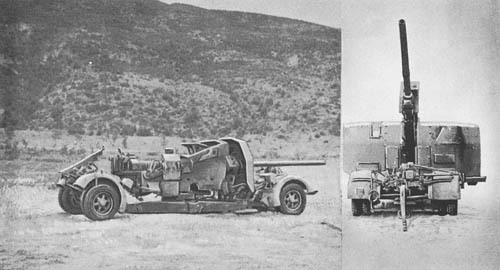 Instead of the Flak 18’s pedestal the gun was mounted on a turntable and trunnioned well back, to be as low-set as possible. The ballistics were greatly improved, and a powered-roller loading mechanism-drawing its power from a hydropneumatic piston operated on recoil -speeded up the rate of fire. 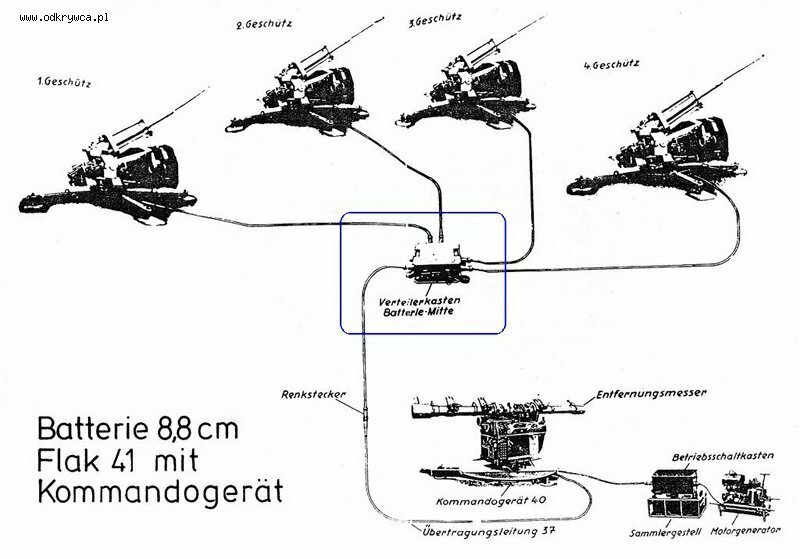 The most adventurous part of the design was the barrel, but here (in the opinion of many authorities) Rheinmetall’s designers overreached themselves. The barrel was divided into three bore sections with a sleeve, a jacket and a locking collar to hold everything together, plus a complicated arrangement of a retaining collar and a ring holding the breech-ring in place. This was all very well on paper, but in practice it gave a good deal of trouble owing to the cartridge case failing to extract. Part of the trouble was due to the fact that the joint between the first and second sections of barrel fell exactly at the cartridge case bottleneck: steel cases expanded into this joint and became stuck. Special brass cases were developed, which overcame the trouble to a large degree, but it periodically recurred; this was probably due to the high chamber pressures involved. The design was eventually changed to a two-section liner with a jacket and a sleeve. The 152 guns issued with the original three-piece liner were marked with a yellow band around the barrel and a yellow m painted on the breech-ring, indicating that they were only to be used with ammunition having brass (Messing) cartridge cases. A further 133 guns were then issued with two-piece barrels, but the trouble persisted-though to a smaller degree-and was largely due to the different expansion factors of the chamber and cartridge case when under severe pressure. The design was again changed to a heavier two-piece barrel with a jacket and no sleeve, and the remainder of production (some 271 guns) used the third type of barrel. In spite of all this trouble the Flak 41 was a good weapon, and specimens were still used by the Czechoslovakian army until the early 1960s. This entry was posted in Artillery by MSW. Bookmark the permalink.